Lady author re-instated after 123 years! Regular readers may remember that in April I set out on the trail of 19th century local author Dorothea Jones, who wrote under the pen name “ Gwynfryn”. She had been a prolific contributor to improving magazines and from these articles her first book Friends in Fur and Feather was published in 1869, and later followed by Sick and in Prison, and The Otter’s Story. Always coy about her real identity, Dorothea Jones dropped additional clues in her later books, referring to the titles of her previous publications and dedicating The Otter’s Story to her brother William Basil the Bishop of St David’s. 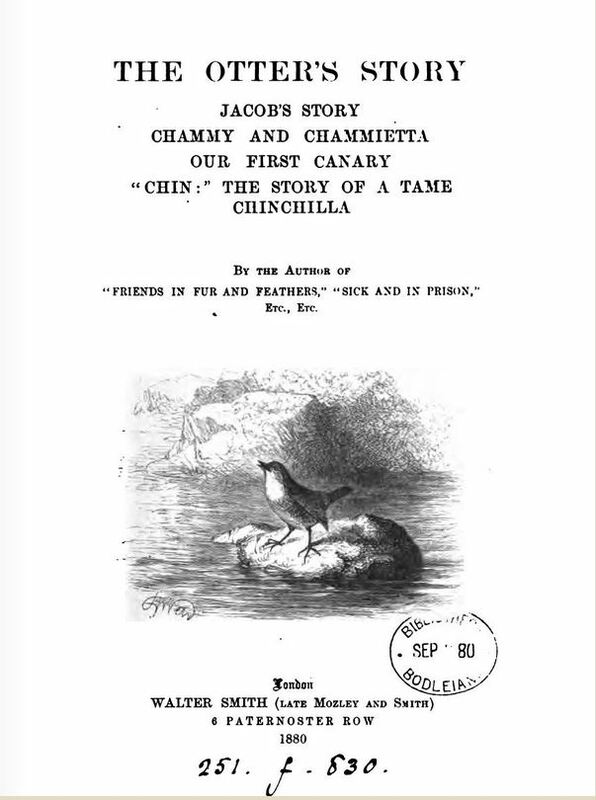 Title page of her second book, a collection of articles, The Otter’s Story Etc. All Dorothea Jones’s work has subsequently been misattributed to the American nature writer, Olive Thorne Miller, who published in 1880 “Little Folks in Fur and Feather and others in Neither” and the similarity of titles doubtless led to this error. I am pleased to report that after correspondence with the Bodleian Library, which holds one of the misattributed copies, Dorothea Jones is re-instated in the catalogue and her transatlantic mimic is no longer credited with her book. The Head of Collections wrote explaining that the error goes back to the 1890s when a Bodleian cataloguer made an incorrect identification based on similarity of title. Dorothea Jones had died in 1885. In the ensuing years and especially the recent past, the error has been compounded, for Dorothea’s other two books are also attributed to Olive Thorne Miller in major libraries around the world. The reproduction out-of print books which can be ordered on the internet these days also all attribute her titles to the American author, and the online scanned original editions displayed by Google Books, Open Library and other sources are similarly mislabelled. It has taken one hundred and twenty three years to correct the original fault. It may well take a further century to correct the fan of misinformation which has followed. I am sure that the Bishop’s sister would be delighted to know that Friends in Fur and Feather is listed on page 2409 of the august modern edition of The Cambridge Bibliography of English Literature. However she might be less pleased to find it attributed here too to Olive Thorne Miller! If the dead really did spin in their graves there would surely be a deep hole at her burial site by now. Not far up the road from Gwynfryn, birthplace of our forgotten author Dorothea Jones is an area of wooded, rising ground overlooking the Dyfi estuary. In Dora’s day it would have been predominantly scrubby oak woodland, – the Sessile oak, Quercus petraea which clothes the Cardiganshire hills. At its feet, the low lying land towards the estuary was pasture, for in the early 19th century much of the salt marsh had been drained by a system of dykes and embankments. Today the surviving salt marsh habitat is best seen in the ribbon of land cut off by the railway line which snakes northwards from Aberystwyth to Machynlleth, and through mid Wales to Shrewsbury and the wider world. This high ground woodland had long been part of the lands of the Pryses of Gogerddan and was known as Parc Bodvage, later Lodge Park. In 1637 a lease of Park Bodvage granted by Richard Pryse of Gogerddan reserved to himself and his heirs “the pasture of three horses, nags geldings or mares at all times during the said terme within the said parke, and common of pasture for his and their deare [deer] within the said parke, with free access egresse and regresse thereunto to hunt course chase or kill the same at his or their pleasure…” By the 19th century the deer were gone, but the Pryses remained indefatigable sportsmen and their game books in the National Library of Wales list the yield of the hunt. In addition to foxes, otters and pine marten, rabbits and hares, the woodland and the marshes yielded pheasant, partridge, geese and duck in season, snipe, woodcock and even the odd corn crake. In the 20th century, the family fortunes became extinct, and the estate broke up. The Forestry Commission soon enrobed the high ground in conifers and the dwelling at the centre, which by 1800 had become a substantial gentleman’s residence was sold off with less than half its garden. The pasture land became separate holdings with its former tenant farms. 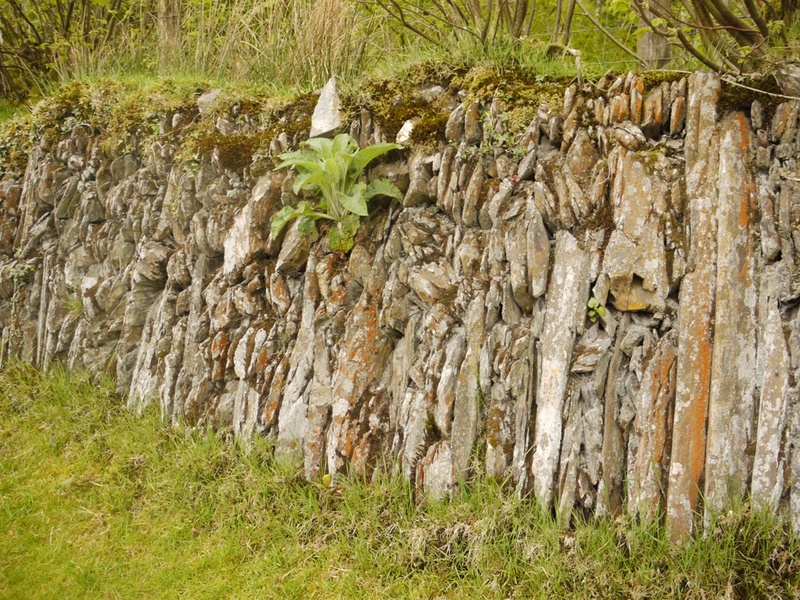 It is through this divided patchwork of history that a group of Welsh Historic Gardens Trust enthusiasts sought, last week, to unravel the traces of the original land-use, for Lodge Park is thought to have been the only medieval deerpark in the county. Like the many better known parks in England it is a lozenge shaped area of woodland grazing, around 100 acres in size, which had at its centre a lodge, a building used by the parkers in managing the deer and possibly as a place of refreshment when deer hunting became less of a larder activity and more of a gentleman’s sport. Like other parks it retains on parts of its circumference the characteristic ditch and bank construction, which would originally have been topped by a palisade. 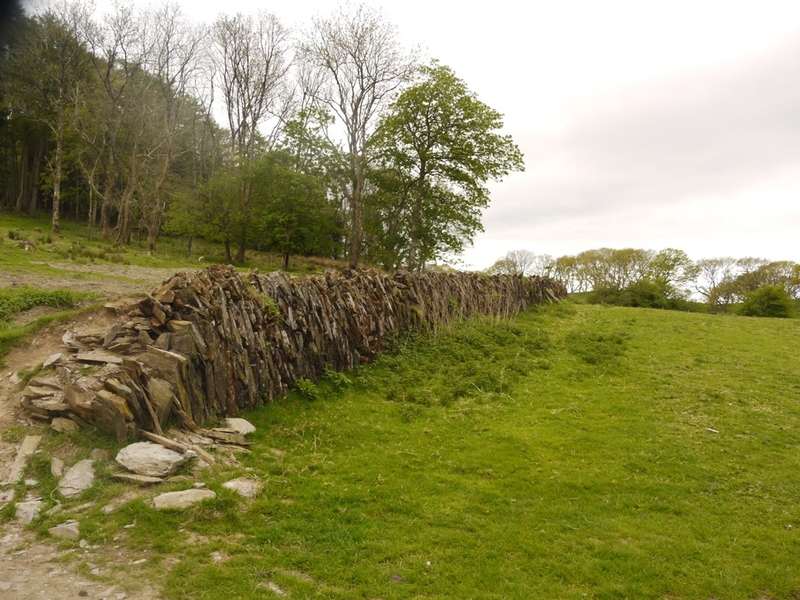 The ditch is on the inner side of the park, while the outer side of the bank is constructed of carefully placed vertical stones set into the earth bank, quite unlike the traditional herringbone arrangement of diagonal stones seen reinforcing field banks throughout the county. Some interesting people occupied the enlarged parker’s lodge in the 17th century. This was the time of great mineral exploitation in the area and much of the British coinage of the time comes from Cardiganshire silver, minted at the Tower of London, and later at Aberystwyth Mint. The leases of mining rights were granted by the Crown, first the Hugh Myddleton of Chirk Castle (1620-31), and later to Thomas Bushell (1637-42) and both men leased the house at Lodge Park from the Pryse landowners. It must have been galling for the Pryses of Gogerddan to receive only their rent, while riches in lead and silver were extracted on behalf of the king. Eventually Sir Carbery Pryse, 4th baronet, was influential in bringing to the statute book the Mines Royal Act of 1693. Thereafter Cardiganshire experienced its own “gold rush” as landowners could exploit and profit from their lead and silver mines themselves. One of the great legends of the county is Sir Carbery’s ride, virtually non-stop and at a gallop from London to Gogerddan to bring the news home and commence the exploitation of his lands. Mining villages sprang up to meet the demand and a great influx of Cornish migrants brought their expertise from the tin mines of home. Another legend perhaps arises from the hasty disappearance from Wales, during the Civil War, of the royalist mining engineer, Thomas Bushell. Later he made peace with Oliver Cromwell, and also mined in England for the protectorate and for Charles II. 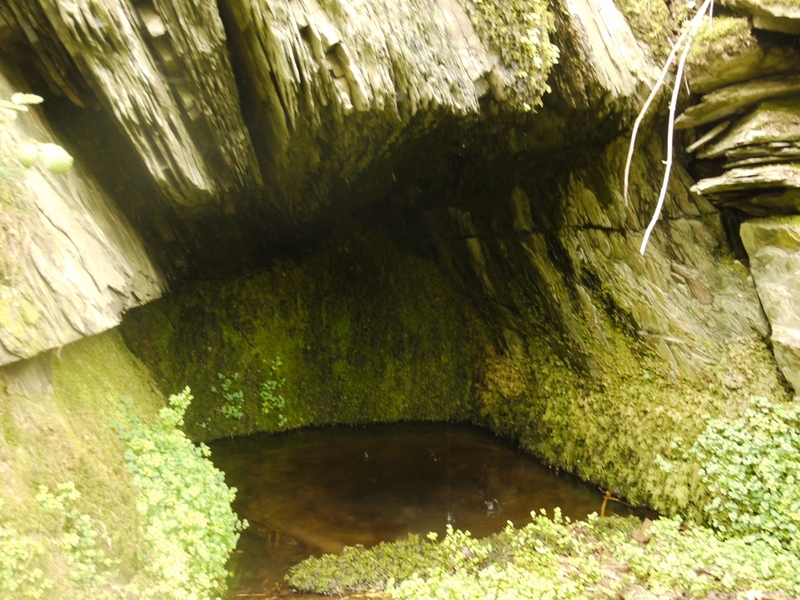 But his name remains linked in local folklore with a rock cut spring on the north flank of Lodge Park, “Bushell’s Well”. Considering the number of mines which Bushell opened, driving adits into the hills and retrieving others from flooding, this seems a very slight structure to bear his name. But in Bushell’s Well, the oral history goes, Bushell drowned a woman, variously a maid servant or his wife. 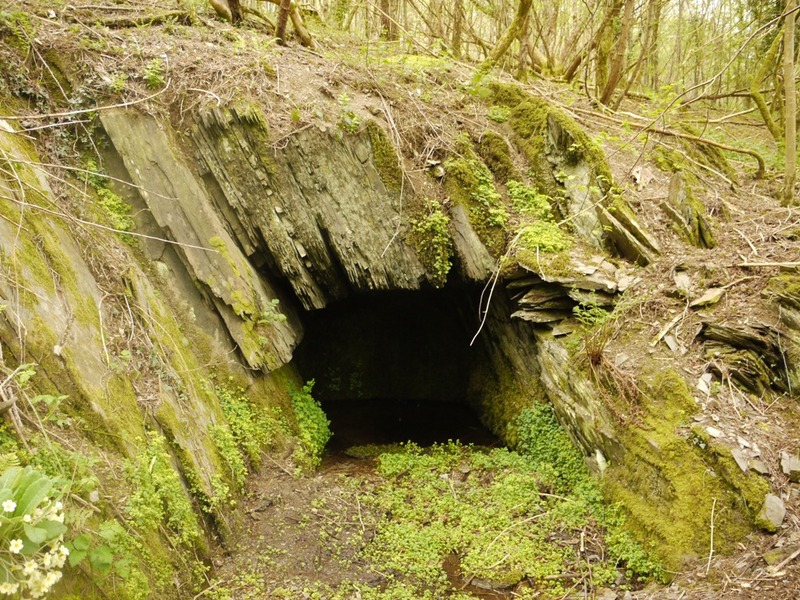 It is a tidy drinking place, cut into the living rock in the manner of a mine entrance, the clear water pooled by an 18 inch lip of rock at the entrance to the recess. No one could drown in such a well unless they were held down in the water.